Is there anything else about the camper that would help us in our planning? Summer camp at Crabtree Farms for rising 3rd grade through 6th grade! Hip hip hooray! Join us as we deepen relationships with local food ways, spend time in nature, and investigate edible plants at various stages of the growing cycle. Participants will enjoy both indoor and outdoor (weather permitting) activities, art, games, and daily snacks with food grown right here on the farm. About the Camp Leader: Beth Vandergraph–As both an educator and student of children, Beth is inspired by the courage, creativity, and spontaneity children bring to new moments. 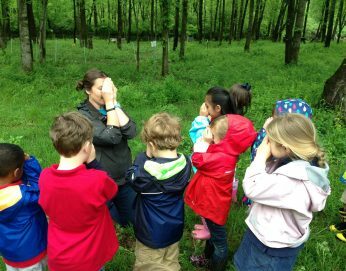 She is rejuvenated by time in the natural world and is especially excited to provide more opportunities for children in Chattanooga to explore nature at Crabtree. Refund Policy: Refunds are not available less than three weeks prior to the start date of the camp except in the case of doctor-documented illness.